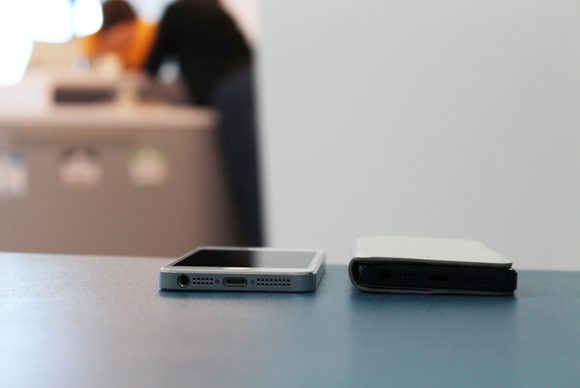 Twelve South's $35 SurfacePad is a sleek and elegant looking cover for your iPhone 5 that doubles as a stand. Unfortunately, it doesn't have much going for it apart from looks—it fell apart on me relatively quickly, and provides little to no protection from drops. Made from soft leather, the SurfacePad covers both the front and back of your iPhone. 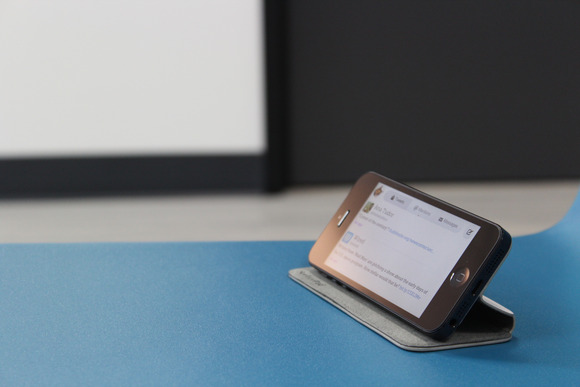 It has a folio-style cover that flips back when you need to use your iPhone's display, and that cover can fold into a stand for propping your phone up in landscape-orientation as well. It's available in three solid colors: red, white, or black. The SurfacePad keeps your iPhone 5 thin and light. The SurfacePad leaves all of your iPhone's buttons and ports accessible to use. The volume buttons and Ring/Silent switch are hidden by the case's front cover, and while the volume buttons are easy to use, the Ring/Silent switch is a different story: you'll have to flip the case open to reliably get at it. The back camera is also exposed via a small cutout in the back of the case. Applying the SurfacePad to your iPhone is a bit different from other cases. 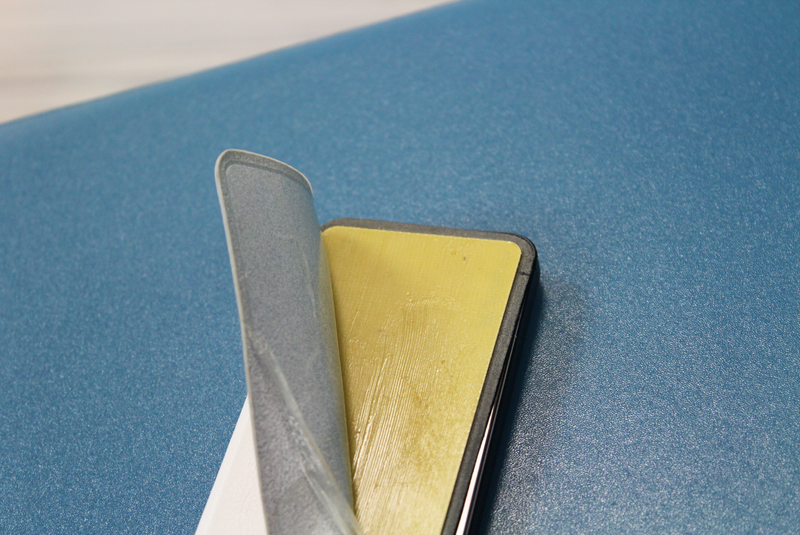 You attach the cover like a sticker, affixing it to the back of your iPhone. Careful now, as you'll want to line it up just right. It took me two tries to get it done, but it seems like the adhesive held up fine after peeling the whole case off. Your milage may vary, but I'm not a fan of this adhesive approach. The one thing this cover does well is keep your iPhone slim and keep the screen free of scratches, as the hard flip-cover on the SurfacePad acts as a barrier and provides a small amount of padding. (While the touchscreen on the iPhone is relatively scratch-resistant on its own, it isn't impervious to minor damage, so keeping it covered only helps prolong its life.) But while the iPhone's display is kept protected, the rest of the iPhone's body is a bit neglected: three sides of the iPhone are completely exposed, leaving it vulnerable in case of a drop on its sides or corners. The cover now splits open and flaps about like an extra piece of skin. Surprisingly, the cover came apart in less than a week of pretty light usage when I was testing it, and Twelve South's support team was quick to offer a replacement. It seems as if other people have gone through the same process and gotten a new cover without problems, though I'm still a little concerned about its longevity. Apart from the cover peeling apart, the SurfacePad seemed fairly durable and well-designed. What the SurfacePad lacks in protection, it makes up with its super-slim profile and versatile cover. For a flip cover case, it's light and thin, but doesn't offer a high level of protection.